I have had a large bag of vintage patchwork blocks that I purchased for about 15$ a few years ago. They haven't all turned into something immediately like I thought they would when I bought them. I am sure you are familiar with this type of thing. Many, many of them are Dresden Plate blocks, but a handful are a collection of oddballs of various sizes, techniques and prints. Here are some of the misfits patched together and covering some extra chairs in the dining room that we pull to the table when the room gets extra crowded (its always a little crowded). And I adore them. These chairs were close to getting a layer of paint. But I resisted, reminding myself how important a natural stain of wood can be to a room. I am good at forgetting this. Needing to paint something, I painted the walls instead. Cream. I decided at Thanksgiving that my dining room walls needed to be cream and I am still adjusting. I always liked that blue, but somehow it felt too much like a bedroom color. I'll share more views of the room soon once I can see over the laundry on the table (2017 perhaps?). I actually have so many little house tweaking confessions to share here. One at a time I guess. Which is never how I go about the tweaking, of course. I also cleaned my studio so well for the mag shoot last week, that I thought I should take pictures, knowing of course how long it would not last. But speaking of patchwork furniture- I am overwhelmed not just at how many modern style couches live in the Twin Cities, but at how many generous people own them! I've never seen so many email submissions for helping me out with a furniture request! Thank you so much! But I did want to mention that we've finally settled on one so there's no need to continue sending your photos. It would only make me more indecisive and I don't need any help there. Completely love the chairs. Exactly what you need when it comes time to squeeze one more in around the table. They are wonderful. I do love the stained wood. Absolutely love those chairs. The quilt blocks are so wonderful and so colorful. Question: do you know anything about old sewing machines?? could you stop by my blog and see if you can help me with a problem? anyone? please. What a fantastic idea! I love them all - they're all unique and so pretty. I have an old dining room chair that I covered a few years ago. I think it needs a fresh, white coat of paint... and maybe a patchwork cover. I'm so excited! What cream did you use in the dining room? I am going to paint my dining room cream, too. It's been a greenish color for a while and I want to lighten it up but I am overwhelmed by the options. I don't want it to look white at all but I don't want it to look light yellow either. I know light is different in every room but I am trying to narrow down my options!! Birdget, I KNOW! White/cream is HARD! I went with Behr paint+primer color called Polished Pearl. It is a very warm cream. Wow! Love the graphic tone. what a great idea for those chairs. I am redoing my kitchen chairs and using, ta-da, Drawing Room. Oh, I love that fabric SOOOO much! Shockingly, I've been contemplating white in my dining room. But like the patchwork seat covers, I'm not sure my Hubby would go for it. Yours look fantastic. Geez! I love that. I did something similar with the couch in my studio. Is there anything a quilt can't be applied to and made instantly perfect? Wonderful use of those quilt pieces! Ha ha, cream, our house was cream when we moved in (and still is). I put loads of different coloured paint on my walls last year, but then found some Amy Butler fabric that I loved and just had to have as curtains! I then decided that because they would be so bold I would go with off white.... cream! Still haven't decorated... waiting for new fire place ... kitchen and possible extension.... still have splodgey walls!!! Anyway... cream is perfect for adding splashes of colour and you certainly know how to do that. Great use of those pieces. Also..please do tell me how you manage to do sooo much with so many kids??? I have one kid and hardly any hours for my creative urges! Except off-course if I'm up all night. Advise advise..
laundry 2017 is me all the time! I love the chairs ,what a great idea! I have inherited my sweet mama's chairs and am slipcovering them in cream . I resisted the urge to paint them too and I'm so glad ! Can't wait to read about the quilt show . gorgeous chairs...and i agree, what an awesome idea!!! 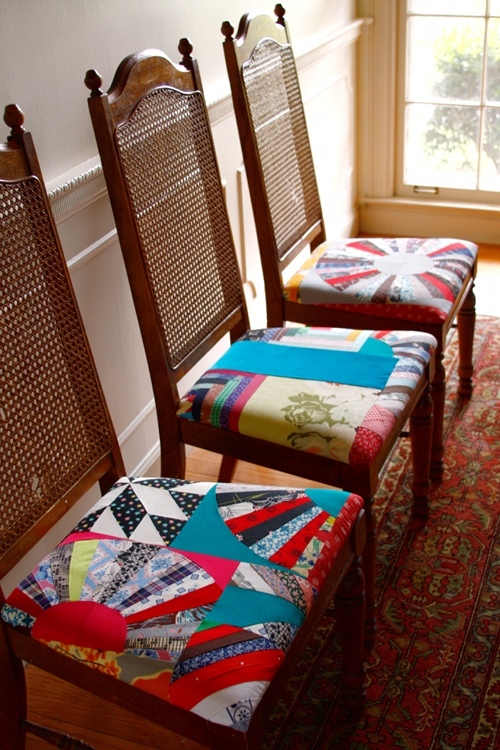 we have a couple of chairs to recover, and what a great way to use up those scrap fabrics! I've always loved patchwork, but the past few months I've just been obsessed with it! I want it everywhere. Love the patchwork chairs, as you know, I am a fan! Perfect idea! Those chairs turned out FAB. I've had this fantasy of re-doing our laundry room for AGES. When the nesting set in with baby #4 I was sure I'd finally get around to it but... Baby will be here any day, and I still haven't painted or added shelves or hung the fabulous vintage art pieces I picked out special. Someday--2017 is sounding very realistic. I like the great idea for those chairs. I am refurnishing my kitchen chairs and using, ta-da, Drawing Room. Oh, I also love that fabric too much! I gave up having that kind of chairs with 5 kids!! I like what you did with those chairs! I have some old chairs here and this is a nice idea! Thanks for sharing. Wow! Just gorgeous! One of these days my chairs may get a little make-over! Inspiring! Those are gorgeous! I'm taking an upholstery class soon and you've gotten me very excited for it! oh, uh huh.... these ARE the best thing i have seen in weeks. LOVE. We just picked up two antique chairs with upholstered cushions from the curb and I plan to cover them with similar patchwork blocks - you have motivated me to start today!! beautiful chairs and chair coverings! Those chairs are awesome! Too pretty to sit on! They are a great example of how miss-matched blocks can turn into something wonderful! It looks beautiful. I love the mix of different colors. buy acekard 2i I love the mix of different colors. Polo Chair is a leading manufacturer and supplier of chairs in Delhi, India. We provide Chairs for offices, cafe, bars, hotels, educational institutions, hostels, conferences. All our chairs are stylish, durable and comfortable. Renowned supplier of office chairs Delhi, office furniture Delhi, executive chairs Delhi, computer chairs Delhi and leather chairs Delhi. Wholesale supply in Delhi/NCR (Noida, Faridabad, Ghaziabad and Gurgaon), India. Some hostels have communal facilities: a row of washbasins, lockable toilets, and showers which may be lockable, may be separated by a curtain, or may have glass doors. Find out how with the aim of execute a switch telephone lookup or else a mobile phone lookup otherwise yet a phone number reverse phone lookup with the purpose of come across absent who is down that role to has been calling you this total instant ok. I enjoy this nice rearrange phone search or cell phone lookup before telephone number search spot. I be capable of hear greatly of cell phone lookup matter about switch telephone lookup here today while I checkered not by the side of home this guide here. What a amazing chair, thanks for this creative thing!